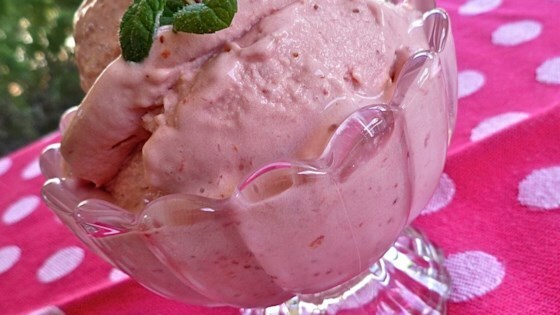 "This vibrant frozen dessert offers fresh berry flavor at its best." Pretty good recipe. Next time I try this, I'll double the batch though. Too much effort to be all gone in just a couple of days. Excellent recipe! I changed a few things: 1/2 heavy cream and 1/2 half and half so it wouldn't be too rich. I also used 1/2 the strawberries (fresh). With those changes, it was fabulous!! !